9/20/2010 – Biographies are now available for all athletes competing at the 2010 Alltech FEI World Equestrian Games, providing up-to-date information for media and fans on all the athletes competing in Kentucky. Information will be updated on a regular basis by the Fédération Equestre Internationale (FEI). Athlete biographies can be accessed through the Media Center page of the 2010 Alltech FEI World Equestrian Games Web site. Many horses have problems in the way they metabolize carbohydrates and sugars. When these horses exhibit clinical signs, they may be diagnosed as Insulin Resistant (IR) or having Equine Metabolic Syndrome (EMS). It is important to know that the various sources of energy from feeds are digested and metabolized differently. The three main sources of energy for horses are carbohydrates (starch), fats, and proteins. There are many commercially prepared high fat, low starch diets now available for these horses. Managing pasture turn out and grazing is also of vital importance. Grazing muzzles can save these horses lives! A way to identify horses with possible metabolic problems is to evaluate their overall appearance. Most of these horses will have abnormal fatty deposits along their neck (cresty) and at the base of the tail. Many geldings will also have increased fat deposits around their sheath. A long hair coat, low energy levels, recurring muscle, tendon, and/or ligament injuries, abscesses and laminitis are other good indicators of metabolic disorders. Blood tests are indicated to determine which disorder(s) is present. Research indicates that an overweight horse is more likely to become insulin resistant. OUR MUSTANGS ARE GETTING THEIR SANCTUARY AND HAVE THE BLM’S SUPPORT! Over the past three days, I have been to meetings in Sacramento and again in Washington, DC. I’ve met with BLM Director, Bob Abbey, and Deputy Director, Mike Pool, along with the Wild Horse and Burro team. The BLM has officially agreed to support going forward with the development of the wild horse Eco-sanctuary for the horses in holding! Also in DC, I met with Congressman Jim Moran, who had already given his blessing, but is submitting legislation to members of Congress on behalf of these wild mustangs. We are so thankful to him and his staff for their efforts on the wild horse and burro issue. All the meetings were fabulous and we could not be happier about the news! 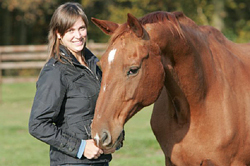 Visit the website at www.horsesinthemorning.com. We are very excited to announce that we are again taking HRN to a new level with the first ever live morning show for the horse addicted. A light, lively, entertaining daily look at the horse world and the people in it. Hosted by Jamie Jennings and myself and produced by Jennifer H. The show will include entertaining conversation, out of the ordinary guests, numerous regular horse related segments, listener call in, contests, giveaways and so much more. HM Queen’s Horse to Represent Birmingham at Royal Windsor Racecourse’s PFA Football Furlong Raceday – Sunday, 8th August 2010! Richard Hughes with HM The Queen, courtesy of Rod Kohler. 6 August 2010 – Racehorse Olympic Medal, owned by Her Majesty The Queen, trained by Roger Charlton and ridden by Jim Crowley, is due to run in the 4.30pm race at Royal Windsor Racecourse on Sunday, 8th August 2010. Participating in the Football Furlong raceday means that following the draw, Olympic Medal will be representing Birmingham as part of the PFA-partnered Premiership football-themed raceday, and will instead run in the yellow and blue silks bearing the number eight on the back of the silks instead of Her Majesty’s famous colours (purple body with gold braid, scarlet sleeves and black velvet cap with gold fringe). Following the draw, Champion Jockey – Ryan Moore – will be partnering horses representing Villa, Arsenal, Spurs, Man Utd, Stoke and West Ham in Sunday’s PFA Football Furlong Raceday. Astrid Appels from Eurodressage joins us this week for a preview of the Alltech FEI 2010 World Equestrian Games. Listen in right here. Las Vegas, NV – September 16, 2010 – The 2010 High Roller Reining Classic (HRRC) runs this week, and the highlight events on Saturday and Sunday, September 17-18, will be featured on Equestrian Life at www.equestrianlife.com/highroller. The High Roller Reining Classic is held at the one-of-a- kind hotel, casino, and equestrian center South Point in Las Vegas, Nevada. Live coverage of the High Roller Reining Classic on Equestrian Life will begin with the Non Pro Derby on Friday, September 17, at 11 a.m. PST/2 p.m. EST and resume with the Open Derby on Saturday, September 18, at 11 a.m. PST/2 p.m. EST. Equestrian Life is celebrating its second anniversary as the media partner for the High Roller Reining Classic and will once again provide live streaming video coverage of the Futurity, Non Pro Derby and Open Derby classes free of charge at www.equestrianlife.com. One of Equestrian Life’s most popular events, HRRC attracted over 10,000 online viewers in 2009. A simple, free registration on www.equestrianlife.com/highroller is all it takes to get cutting-edge coverage of the High Roller Reining Classic from the talented team at Equestrian Life. In addition, viewers will be able to participate in live chats with other fans and members while the derbies are being streamed online right from the same webpage. The Women’s Horse Industry Association is pleased to announce that PJ Cooksey will speak during the luncheon on Wednesday, September 22, 2010. The luncheon is part of the WHIA’s conference being held September 22-23, 2010 in Louisville, Kentucky at the Crowne Plaza Airport Hotel. The theme of the event is “Marketing and Managing Your Horse Industry Business” and is open to members and non-members of the association. “Cooksey is one of the most entertaining public speakers in the industry and we are very excited that she was able to take time out of her schedule to talk with us. Her credentials are stellar and her personality is something special,” states Executive Director, Catherine Masters. Cooksey started off as a groom at Waterford Park in West Virginia in 1978 and a short time later, became an assistant trainer of a 30 horse stable. Then the bug to become a jockey hit her. On August 20, 1979, she won in her first race aboard Turf Advisor, quickly becoming the track’s leading jockey, both male and female. Her phenomenal career has provided her with many awards and records.